Families in Lahore can now experience the trampoline mania for themselves by visiting the brand-new Funco Air Park. Funco Air Park is centrally-located on Gulberg’s Main Boulevard and consists of wall-to-wall trampolines. In addition to free jumping, visitors at the play park can host themed birthday parties, team-building sessions, play dodgeball, and even sign up for ‘Airobic’ fitness classes. Funco Air Park offers Lahoris of all ages an opportunity to enjoy exciting indoor activities throughout the year. Built upon an eight kanal plot, the design, and development of this large-scale, international project was a complicated yet ultimately rewarding experience. Being tasked with any project involving construction in Lahore brings with it its own unique set of challenges. However, with years of experience in managing construction work, for both commercial and residential clients, Amer Adnan Associates (AAA) was eager to take on this creative project. 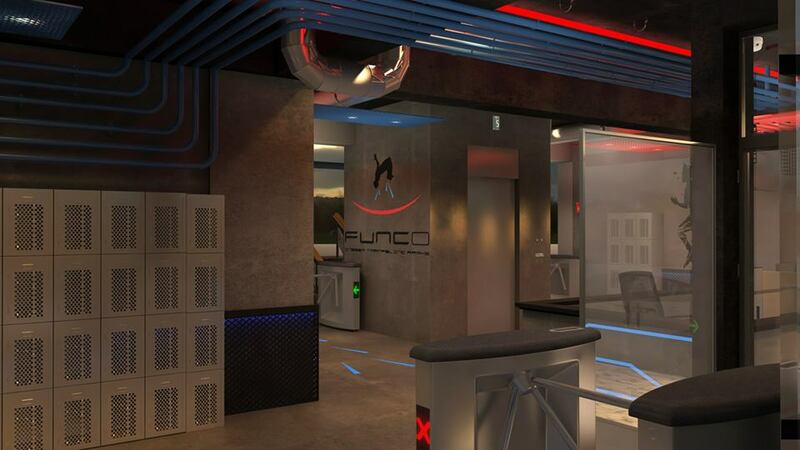 The Funco Air Park project was completed over the span of one year; this includes the initial designs, construction work, and the interior design details. As architects, the team wanted to preserve the functionality of the playland without losing out on the aesthetic appeal for the target customer – adventure-seeking children and adults. Upon walking in, neon lights and graphic artwork on the walls immediately grab the visitor’s attention. The two-storey building includes a cafeteria, known as the Munch Cafe, and a sitting area on the first floor. A visitor relaxing on the first floor will have a clear vantage point of all the action below in the main play area. The ground floor consists of imported trampolines and top-grade foam mats to ensure safe play for all participants. Every single trampoline was installed under the supervision of the AAA team. Brightly-painted artwork around the entrance provides high contrast against the building’s grey-toned exterior. Amer Adnan Associates strives to exceed the client’s expectations by actively listening to their needs. Our designers and architects keep working until the client is completely satisfied with the final product. Challenging projects like Funco have always been a great learning experience for everyone working at the architectural firm.